Hindsight is a wonderful thing. 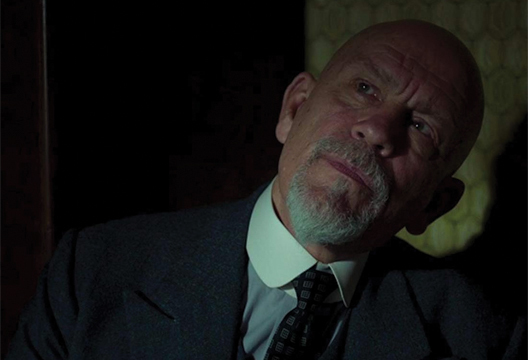 Why has nobody ever cast John Malkovich as Hercule Poirot before? 2018 finished with the new version of The ABC Murders on BBC One we never knew we needed, penned by the screenwriter Sarah Phelps, whose credits range from EastEnders to the RSC. This is Poirot, but not as we know him. Phelps layers darkness upon darkness. Poirot is out of favour with the public, and the police treat him with contempt. Flashbacks and a conflicted relationship with his Catholic God hint at past trauma. He lives in a London where immigrants are increasingly vilified. It is hardly surprising that Poirot is ill at ease with himself, a man who dyes his facial hair, and who lives a solitary existence, no companion-chronicler Hastings in sight. This dispensing of the tweeness of Poirot which has become so much a part of David Suchet’s portrayals of recent years, exposes Poirot’s vanity as something more desperate, and his mannered affectations as a brittle defence, but against what, exactly? Like all the best protagonists, Malkovich’s Poirot is ambiguous: attractive and repellent at the same time, ridiculous but wise, and eliciting sympathy and annoyance in equal measure from the viewer. We meet him in The ABC Murders – a series of grisly crimes all involving a brand of tights called Twinkle Toes, and starting with Alice Ascher in Andover, followed by Betty Barnard in Bexhill... you get the picture. As the story unfolds Rupert Grint’s Inspector Crome is blinded by his dislike of the Belgian, and struggles to find ‘the code’ which links the murders, but it’s obvious to Poirot – he is the code, and all the murders have a link to him. The conflict between the younger, ambitious and chippy Crome, and the older, antagonistic detective, replaces the bonhomie we’ve seen in other characterisations, where Hastings and Poirot rub along in mutual respect and friendship. Phelps has stayed true to much of Christie’s story-telling, but has twisted and embellished where it suits her. The landlady of the chief suspect becomes a bitter and needy woman who pimps out her daughter to her lodgers. The fiancé of the second victim is a vain and shallow buffoon. Poirot’s back-story is enticingly revealed little by little, episode by episode – a backstory Christie herself had always left vague. There are some lovely touches in this production: time and time again a typewriter violently crashes out letters from the killer taunting Poirot to find him; the cinematography is dark and menacing; and the 1930s costumes and architecture are a stylistic dream. I should caution that not everyone was as enamoured with this production as I was. Agatha Christie purists can be found on platforms far and wide, furious at what they see as gratuitous tinkering, and resulting vandalism of sacred texts. For me, however, Phelps has removed something which has always been a barrier to my Poirot enjoyment. Malkovich’s Poirot is real and pantomime at the same time, and all the better for it.